SourceCon. 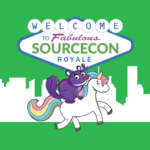 What in the world is SourceCon? That was the question I asked myself in September 2015 right before my very first SourceCon. I had never been to SourceCon, or Dallas for that matter. I had no idea what to expect. For those of you who know me, you know that I’m not really the shy type, but this time I was nervous. Really nervous! I was there alone. I didn’t know a soul. I only knew twitter handles like GlenCathey, TheReruiterGuy, @SourcingShannon, @imJeremyR.